INPROM, one of the leading Russian metal distributors, was established on February 15, 1996. Its authorized capital is $10,56 million. INPROM has been one of the biggest Russian network companies, operating in the metal industry. The Company supplies its customers with hundreds of thousands of tons of rolled steel, carbon and alloyed steel tubes, produced by nearly every iron and steel factory in CIS. INPROM is listed among reliable partners in the federal register of the Russian Chamber of Commerce and Industry. 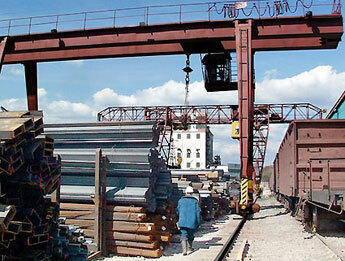 Since 2001 the Company has been member of the Russian Association of Metal and Steel Traders (RAMST). In the first half of 2004 INPROM was ranked fifth in the prestigious national nomination "Universal Supplier". With 29 branches across Russia, the Company is the country's second largest independent steel service network, according to the Metal.Com.Ru Trade System ratings. INPROM's main customers are construction, engineering, mining, and energy firms. The total area of production and storage facilities has exceeded 1.1 million sq. m. in 2006. INPROM’s steel service centers are equipped with up-to-date steel processing equipment of leading European manufacturers. More than 500 different steel products totaling more than 100,000 tons in stock are constantly available at the company’s warehouses. Revenue in 2006, calculated to Russian Accounting Standards, stood at 12.05 billion rubles ($446 million), up 47 % year-on-year. The company's quality management system is certified according to ISO 9001:2000 standard. Since 2003 INROM has been audited to International Financial Reporting Standards by Deloitte&Touche.